Enjoy an amazing safari at GIVSKUD ZOO. 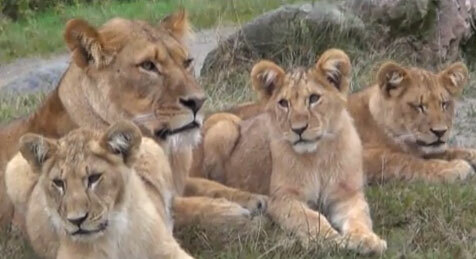 Get up close to lions, giraffes and rhinos. And take a wild walk 150 million years back in time and meet giant dinosaurs. Look forward to an exciting day in the animal kingdom where the whole family gets to enjoy fun times together. Drive the classic safari route in your own car and meet animals from Africa and the Americas. Watch zebras cross the road and look out for the many species of antelope. Naturally, safari tours end with the lions. Feel the thrill when the big cats prowl around your car – if you dare! You can also head out on a foot safari and greet the silverback Kipenzi and his gorilla troop – or see wolves and elephants being fed. Remember also to visit the large tropical biosphere with the park's newest predators – South American giant otters – swimming around in their pool. You can watch feeding time and kids can even help zookeepers feed the camels. For further information, visit givskudzoo.dk where you can also read about newborn baby animals among the approx. 60 species at GIVSKUD ZOO. Stay close as you walk around the awe-inspiring dinosaur park. Don't be alarmed when the T-Rex turns its head and roars or when the Dilophosaurus hisses. All the 25 dinosaur species are life-sized, even the 40-metre Argentinosaurus, the world's largest dino. End the day with fun at the large playground where children can let loose – or try some of the many other kid's activities in the tipi camp during weekends and peak season, such as gold panning and campfire bread baking. And in the dinosaur park you can also make a cast of a dinosaur tooth or go fossil hunting.